August 20, 2018, 8:20 a.m. 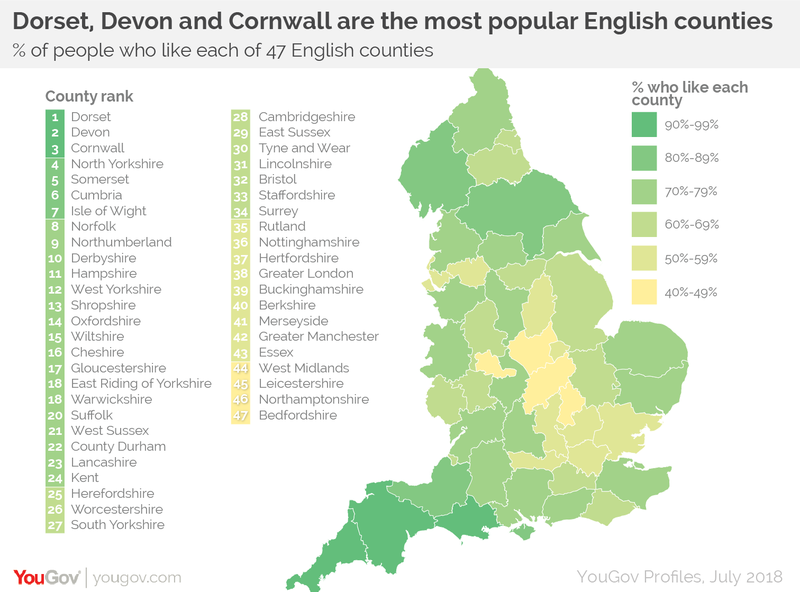 Newly released YouGov Profiles data on the opinions of more than 42,000 people towards 47 English counties reveals that Dorset and Devon top the popularity charts, with 92% saying that they like each of the counties. The South West is actually home to four of the top five most liked counties – Cornwall places 3rd at 91% and Somerset 5th at 86%. The only county outside the South West to make the top five list is North Yorkshire, in 4th place at 87%. Only two other counties had a like rate of 80% or higher – Cumbria (85%) and the Isle of Wight (80%). At the bottom of the table, Bedfordshire is the least liked county, with only 40% saying they like it. In a more distant second-from-last comes Northamptonshire on 47%, with Leicestershire third from bottom at 48%.